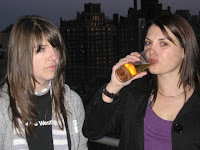 Ok kids, its Thursday night BlogandBeers, sorry Joe, already bought….Among the plethora of pics circulating from SES NY 2007 last week, we came across this pic of us which is a wee bit out of character…. man I am dying to insert a joke here, but we thought we would throw it out to you, our adoring public. We know there are like 4 of you out there…. I’ll keep it simple for you… best caption wins! Mine is soooo good btw so you better dig deep. I know what you’re thinking, what do you win? I have to be honest, you are not going to win a date with an SEO, you are not going to a win a round trip to Scotland or Canada, however, you may win a link from this very blog! I’m not going to lie to you, we’re linkeasy so even if you comment you’ll probably get a link…. I really wanted to steal that domain name too!! Hey “Nic’n'Cher”. Loving your blog btw! Fantastic goods from you, man. I have understand your stuff previous to and you’re just too great. I actually like what you have acquired here, certainly like what you are stating and the way in which you say it. You make it enjoyable and you still care for to keep it smart. I can not wait to read far more from you. This is actually a tremendous website.